A conundrum situation arises for students and their parent’s when appearing in CAT is the agenda; whether to do preparation through coaching institutes or do self-preparation from home?? ‘CAT’ stands for Common Admission Test and students who are ambitious of doing MBA from top IIMs and top B-schools have to conquer this national level entrance exam. CAT is one of the most highly coveted exams and MBA aspirants and their parents too are always in a dilemma whether to elect for formal coaching so that professional assistance is available throughout the preparation process or opt for preparing from home i.e without any coaching? How to do Preparation for CAT? How will I score high to make through the IIMs or Top B- schools? Should I join coaching or should I be credulous and prepare myself? If I don’t take up coaching how and from where will I study? What will be my study material or books? What will be my schedule to achieve my aim? These are some questions which keep haunting the students who do Preparation of CAT from home. Dear student’s one thing which is pre-required for seeking MBA dream is commitment and spotlight shall be on scoring high in CAT and for that the mode of your preparation matters! The mode which you adopt should be such which fits best to you. If you join a coaching institute then you will have to study and make your schedules as per the formal guidance provided by that particular institute. There are various top institutes which are available as an option to the students for e.g T.I.M.E, Career Launcher etc. But there are other aspirants who attach weight to self-preparation and place confidence in preparing themselves instead of joining coaching institutes. A self- preparatory approach coupled with disciplined and a dedicated plan will give you such result which can derive best out of you and create wonders and help you in cracking your CAT! Though experts and toppers suggest that mentorship of coaching expedite your preparation but there are such also examples also which have cleared and topped these entrance exams and without coaching. For eg. Amit Bikram, topper of CAT 2018 Scored an overall of 100 percentile. He started self-preparation in May 2018 and focused on conceptual transparency and strengthening of fundamentals. He did not take coaching for theoretical part and believed in need -based coaching. To analyse and improve his mistakes he took lot of mock tests. To ameliorate his vocabulary and reading skills he did a lot of reading. Another example is of Swapnil Suman, one of the toppers of CAT 2018 who also scored 100 percentile and for this he did not join any coaching institute. He relied on self- study and for his preparation for CAT he gained proficiency by doing lot of Mock test series from reputed institutes. So you can very well prepare for this entrance exam from home and crack it or even top it. Just the proper strategy needs to be drafted and executed. But before we get into the tips which are required to do preparation from home lets first familiarize ourselves with what actually CAT is all about. WHAT CAT IS ALL ABOUT? CAT, Common Admission Test is a national level entrance exam to qualify for MBA, PGDM Courses into the top IIMs and Top B-Schools. It is an annual examination which is held by one of the IIMs on a rotational basis. The examination is conducted in 2 sessions across 140 centres in India. The minimum eligibility criterion for applying and appearing in the exam is a Bachelor’s Degree with at least 50% of aggregate marks. CAT is not an online exam. It is a Computer Based Test and not an Internet Based Test, which means that students will read the questions on a computer desktop and choose a correct answer from the available options by clicking on it. The candidate will not give the exam on an internet website. For non multiple choice questions, the candidate will have to type the answer. Also, there will be a timer on the computer screen which will tell you the total time remaining to complete the current section which the student is attending. To make aspiring candidates familiar with the examination practice test or sample papers are available on the official CAT website: www.iimcat.ac.in. Multiple Choice Questions (MCQs) and Non Multiple Choice Questions (Non-MCQs) both will make 100 questions, divided into three sections as mentioned above. Each question will of three marks i.e total marks will be 300. Each correct answer will fetch you three marks and with every wrong answer for the MCQ , one mark will be deducted. There will be no negative marking for a wrong answer of a non-MCQ. Also, there will be no negative marking for an un-attempted question. The total time duration for the exam will be 3 hours (180 minutes) that is 60 minutes for each section. The question paper language will be English only. Quantitative Ability is the most redoubtable section of all. It is also the most time consuming due to the vast syllabus which needs to be done to complete this section. Students should start by grasping and gripping the basic fundamentals and concepts and solving the basic questions from each topic. Once you are well versed with the basic questions you may gradually increase the complication level. This section is all about speed, accuracy and time. You can earn all these only when you start from basics and move towards the tougher side. The analytical ability and decision making which is required in this section can be secured through constant praxis and revision. Geometry: Every year around 4-5 questions are asked from this category. Therefore, it is an eminent category and includes topics like Triangles, Circles, Quadrilaterals, Mensuration etc. One shall reap in good knowledge of geometrical theorems and their application for this category. Algebra: Topics like logarithms, sequences, functions etc form a part of Algebra. The wisdom of formulas together with rigorous practice will help you to do preparation of this topic of CAT. Arithmetic: Lot of calculations have to be done in arithmetic, so you need to be fast while doing calculations of questions. This topic includes ratio and proportions, time, speed and distance, etc. Number Theory: This category comprises topics like factors, number systems, remainders, LCF, HCM etc. This part is generally easy from all the above parts and students mostly are able to give their best in this topic. An adequate amount of time should be given in gaining conceptual precision and then only you should move towards solving practical problems. It’s not mandatory to cover all the topics of the section rather it is more crucial that you have attained such amount of accuracy that you are able to answer any question from the topics you have finished. You should examine and do exploration on those problems which take more time to be solved and try to find out means to solve them in a lesser amount of time. Reading Comprehension is an art of understanding and inferring of what you are reading. The skill of interpreting what are you reading and giving it sense in your own words is what is going to help you the most in this section. This art can of reading and simultaneously understanding it can only be achieved if you make a custom to read. The Focus should be on augmenting the reading speed by reading good newspapers, magazines or good stuff on the internet. Develop a habit of reading whenever there is free time. You can also practice through Reading Comprehension Books for CAT. Widen your vocabulary, expand your awareness of Phrases/Idioms and try and familiarize and memorize difficult and fancy words. Pen down arduous words, their meanings, synonyms and antonyms. Make your own notes and keep revising them on a continuous basis. Proper time should be taken to read the comprehension passage and interpret its core point. Avoid taking more than the required time. Figure out the question which has been asked and then give your answer. Don’t rush into answering. While you are reading the passage you should just pay all attention to the words having meaningful message and try to eliminate unwanted words. Reading more is the only mantra to score well in this section. Devote religiously atleast 2 hours daily to reading. Unlike the Quantitative Ability section which is formula based and Reading Comprehension section which is reading and vocabulary based, this section of Data Interpretation and Logical Reasoning is a complete package of surprises. While preparing for this specific section of CAT a divergent approach and strategy is required. This section consists of questions which are related to Data comparison and data analysis. If your analysis while answering the question is correct then you will able to answer the entire set of questions correctly and if your analysis is wrong then you would lose all marks for that specific set of questions. You can only excel in this section through hard-work and exercising regularly. Allotting 2-3 hours every day should be a must. Take lot of Mock test on this topic and try to escalate your speed through them. There are a lot of mock test series available on the internet and you can pick any generic test series. Focus on those topics which are repeatedly asked such as Calendar, Graphs, Pie charts, Time and Clock, streams, boats. These topics are common and essential and are frequently asked. Speed plays an indispensable role in solving mathematical problems. If you are fast you can solve this section quickly within the allotted time. You can work on ascending your speed and methods for solving mathematical problems by watching various video tutorials available on the web. These tutorials are available in the Hindi language as well as in English language and through them you may learn short tricks and formulae’s for eg. You can get to learn tables through short way or calculate square roots and cube roots in a faster manner. During the examination one thing that shall be kept in mind is to READ the question properly. Data Interpretation and Logical reasoning section requires concentrated reading. Read it once, twice or even thrice and decipher the tricky and confusing words of the question. Once you get hold of what the question is all about, the answer will become rather easy! Such questions are always present in the exam that don’t require formula but if you read and understand logically the answer will be right there. Questions related to graphs and pie charts should be solved very carefully. While doing Preparation for CAT, if you want to bring about mastery in this specific section then a proper methodology needs to be drafted. You can refer to any of the above mentioned books, question banks or CAT Sample Papers which are available on CAT Official Website. Taking Mock tests is an imperative part of CAT Preparation Strategy. 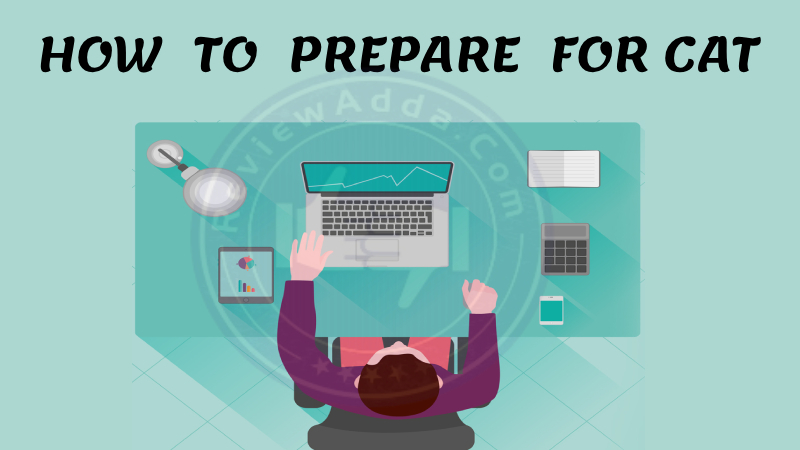 After your basic preparation is done that is when you have completed all three sections at least once, then you can start taking these tests. You should start with one or two mock tests weekly and then progressively increase the number. With each sample paper you will be able to learn your shortcomings and mistakes, the areas in which you need more practice and consideration or topics in which you need to boost your speed. There are various online mock test series available from renowned institutes like from T.I.M.E, iQuanta etc. By these you can analyse your advancement level, keep intact your confidence and develop a faith in yourself that you are heading towards a right path which will ultimately fulfil your ambition. A group of good people and the good atmosphere always create a positive impact on you. You can share your problems and strategies with your fellow group members while doing your Preparation of CAT. Every individual have distinct plans for preparing and so you can always adapt the things which you find appropriate. Doing group study always create a feeling of competition and that will help in protecting you from deviating from your target. You can solve mathematical problems together or even take mock tests. In today’s digital world literally everything can be availed on internet. Through internet you can visit website of CAT, various other online institutes and can get whole lot of sample papers and mock test from there. You can get wide range of study material relating to your sections of CAT. You can be updated of happenings which are related to exam, exam syllabus and procedure. By joining various social media websites like facebook you can become the part of online study groups. Candidates while Preparing for CAT often get so much engrossed in their studies that they forget that keeping care of health and maintaining it throughout is also necessary. Applicants start disturbing their sleeping hours or don’t eat in proper manner. But friends remember victory can be accomplished only if you are well. So take care of yourself, your diet, sleep. Take out one hour from your time table to have relaxation in which you can do anything that provides peace to your mind like walking, listening to music or meditating. Dear students it is needless to say that CAT is an extremely onerous exam, but, self-belief in your abilities will guide you through your preparation path. Students who are preparing for such competitive exams from home shall always have a notion that though this is a strenuous and laborious exam but you have that capability and motivation that you will clear this entrance exam and live your dream of becoming a MBA graduate from IIMs or reputed B-schools. Cracking CAT or any other MBA Entrance Exam requires sticking to your planned schedule of preparation till the end. There are no shortcuts to success and you shall maintain that pace of hard work throughout. Revise again and again and try to eliminate your weaknesses. If a person deploys sincere and honest efforts in CAT Preparation, then it is possible to clear CAT with high score with self-preparation. Strategized plan of action with appropriate time management, consistent hard work and focus on you aim will definitely provide you success. College is Affiliated to Bangalore University and approved by All India Council for Technical Education, New Delhi.